Members of a farmers group in Wote, eastern Kenya, evaluating their soghum trial field. Sorghum assures us of nutritious food for our families as well as cattle; sorghum fetches a better price than maize and gives more yield per acre. 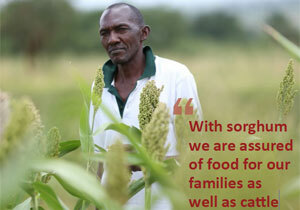 Sorghum has changed our lives for the better… say farmers in Wote, eastern Kenya, who have adopted sorghum-legume technologies instead of the traditional maize-bean intercrop. The farmers were addressing a group of journalists who visited their farms recently. 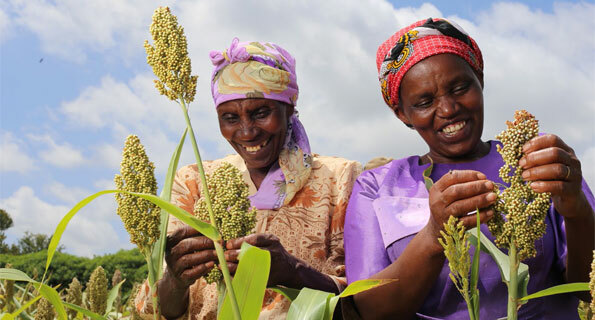 “Sorghum adapts well to a wide range of environmental and soil fertility conditions and is considered to be one of the ‘Climate Change Ready’ crops. Also sorghum and legume cropping systems have inherent resilience to drought and therefore enhance food and nutrition security for households in the drylands,” said Mr Patrick Sheunda, Research Assistant, ICRISAT. Wote faces a grim food security situation. According to a 2012 report released by the CGIAR Research Program on Climate Change, Agriculture and Food Security (CCAFS), only 2% of the households in Wote were food secure throughout the year. Farmers in this area struggle to wrest a meager living from farming as they are adversely affected by drought, a situation made worse by climate change and land degradation. Based on these findings, a group of partners which included the Kenyan Agriculture and Livestock Research Organization (KALRO); the Ministry of Agriculture, Livestock and Fisheries, Government of Kenya; and ICRISAT introduced sorghum and two legume crops (cowpea and green gram), with inherent resilience to drought, to improve the livelihoods of poor smallholder farmers. The project has so far reached 366 farmers in Wote, who have adopted the sorghum-legume cropping system. The released sorghum, cowpea and green gram varieties were used for demonstration of different combinations of intercropping and fertilizer use. These varieties were sourced from ICRISAT and KALRO for evaluation in collaboration with the private sector. “The participatory trials were maintained and evaluated by the farmers until harvesting. The farmers were supplied with fertilizer, pesticides and fungicides for experimentation; and they were trained on proper agronomic practices and crop protection,” said Ms Rachel Kisilu, breeder at KALRO. The project uses the ‘mother and baby’ trial approach where farmers organize themselves into groups, with the ‘mother’ being the group leader whose farm is used as a learning ground for the ‘babies’ who are the group members. Each ‘baby’ gets to practice and implement in their own plots what they learn from the ‘mother’. “Each mother trial consisted of six sorghum-legume intercrops and a maize-bean intercrop as a control. The idea was to get the farmers to see for themselves that maize and beans are not really suitable for their area,” said Ms Kisilu. At the end of the first season (2013), the farmers selected the Seredo sorghum variety and cowpea as the best performing intercrop. In the 2014 season, the project sought to scale out the technologies to more farmers in Wote and Kathonzweni area, by planting more mother trials at Kathonzweni and increasing the baby trials in both areas. This project is funded by CGIAR Research Program on Climate Change, Agriculture and Food Security. Trials of postrainy sorghum hybrids and distribution of the hybrids to as many private sector seed companies as possible was a major recommendation of the private sector seed industry at a recent consultation meeting. This would enable the companies to test the hybrids in multiple locations and identify the best ones for commercialization. Currently, private sector presence is dismal in the sorghum seed chain as open pollinated varieties are predominant in postrainy sorghum. This initiative would ensure their active participation in the seed chain of postrainy sorghum, which is grown on 4.5 million ha in India, and is highly prized for its food and fodder value. Inaugurating the meet, Dr David Bergvinson, Director General, lCRISAT, called upon the private sector to take note of the recent strides in postrainy sorghum products development and join hands to elevate the game so that more farmers benefit from increased access to superior hybrids and technologies. Eleven scientists from the private sector attended this meet. After the field visit, the private sector players appreciated the quick progress made by National Agricultural Research System (NARS) partners along with ICRISAT in developing postrainy sorghum hybrids with high yield, preferred quality traits and good fertility restoration which were major challenges in the past. They also recognized the efforts in identifying locations for off-season seed production of postrainy sorghum hybrids. Dr A Ashok Kumar, Senior Scientist - Sorghum Breeding, ICRISAT, presented the recent progress made in developing hybrids and parents and strategic research for improving cold tolerance and fertility restoration, the challenges in seed systems and need for private sector to play an active role. Postrainy sorghum is typically grown on residual soil moisture in the cold season and needs to have inbuilt shoot fly resistance, photoperiod sensitivity, cold and drought tolerance in addition to giving higher yields. Charcoal rot tolerance and aphid resistance are also required for these cultivars as these two constraints are affecting the yields of late. Farmers have stringent grain and stover quality preferences and cultivars with pearly white, bold, lustrous grains and stover with good digestibility are preferred by them. Land race cultivars like M 35-1 and Dagadi local possess most of these traits and hence are popular with farmers. 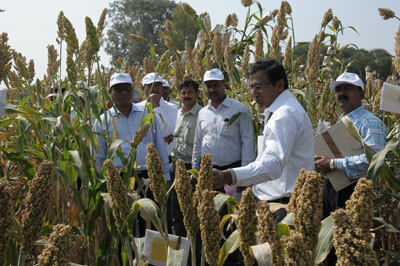 Improved cultivars like Phule Vasudha, Phule Revati, Parbhani Moti and Parbhani Jyoti developed by Indian NARS institutions are becoming popular, thanks to large scale dissemination efforts undertaken by the Harnessing Opportunities for Productivity Enhancement (HOPE)-Sorghum and Millets Project funded by the Bill & Melinda Gates Foundation. Large-scale seed production and distribution of these cultivars and knowledge sharing on improved technologies resulted in increasing grain yields by 39% and fodder yields by 31% in the fields of more than 40,000 participating farmers in Maharashtra state in India in the last five years. The yield gaps reduced by 25-35% and income levels rose by 33-44% in Maharashtra. For every farmer reached by HOPE project directly, five to six non-HOPE farmers benefitted. Thanks to the innovative ‘Seed Consortium’ involving farmers, NARS, Department of Agriculture, Mahabeej (public sector seed agency) and ICRISAT, the improved seeds reached 30,000 farmers in 2014 and this year it will cover more than 100,000 farmers. Others: Ajeet Seeds Limited, Bayer Bioscience Pvt Ltd, Kaveri Seed Company Pvt. Ltd, Global Transgenes Ltd, Nuziveedu Seeds Ltd, Nu Genes Pvt Ltd, Atash Seeds Pvt Ltd.
Volume II of the ICRISAT IMOD Exemplars covers various innovations like the cluster-based approach in enhancing inclusive value chains, technology transfer through business incubators, innovation platform processes, market driven breeding initiatives for dryland cereals and grain legumes, integrated seed systems, and scaling up through market or demand driven innovations. 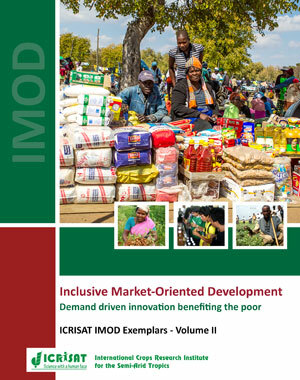 The ICRISAT IMOD exemplars gathered in this volume show the effective application of cutting-edge science to generate knowledge on socio-economic mobility, innovation, and agricultural transformation in different geographical, political, and socio-cultural settings. This highlights strategies for enabling markets and institutions to work for the poor, thereby stimulating agricultural transformation and upward socio-economic mobility in rural areas. Thank you for the newsletter with lot of information on GreenPHABLET, SAT Insect Museum and other interesting details. GreenPHABLET would become vital in the process of technology transfer to marginal/small and medium farmers in rainfed agriculture. This is an important change in ICT and will play a key role in faster transfer of technology to farmers. I am sure the clientele would increase rapidly in the next couple of years. The insect museum is also an important addition which will be useful to many research workers.